These days, as pastor and dean of students at Grand Canyon University, Griffin likes to stroll around a campus that soon will have a Disney-style hub of outdoor dining. Main Street USA, meet Lopes Way. But that isn’t the only major change that has Griffin and others — including those who haven’t even lived here yet — buzzing about what’s ahead. A new era is dawning at GCU with the rise of the engineering building (foreground) and four new six-story residence halls in The Grove (top of photo). 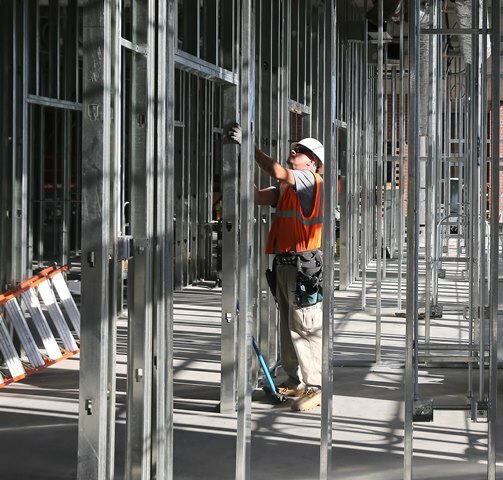 Under construction are four six-story residence halls in a complex called The Grove at the northwest corner of campus, an adjacent parking garage and an engineering building on Camelback Road next to Ethington Theatre. It is a dramatic shift in the look and feel of a campus that by the end of 2015 will have grown from 900 to 15,000 students and from 100 to 240 acres in just seven years. And the centerpiece will be Lopes Way, which with new outdoor dining areas will be the heartbeat of campus in the same way Main Street USA leads to Frontierland, Fantasyland and Tomorrowland. Like everything at GCU, the design is purposeful, said President/CEO Brian Mueller. “When parents and students come on to our campus, we want them to have a sense of community, fellowship, friendship, kindness and compassion,” Mueller said. 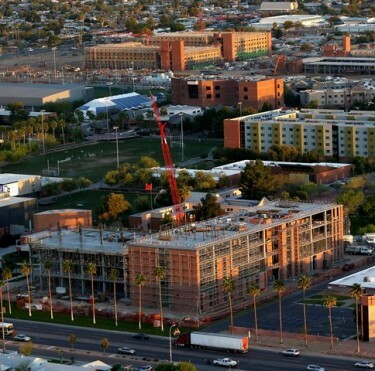 “And we want to take advantage of one of the greatest things Arizona has to offer — weather.” Here, then, is your forecast to all the attractions that will open at GCU in just a few months. Get ready for a wild ride. The first stop on the GCU monorail is Lopes Way. Gone will be the all-you-can-eat cafeteria in the Student Union, replaced by a food court with three restaurants — Einstein Bros Bagels, The Habit Burger Grill and Slices Pizza — plus the soup-and-salad bar and Mongolian 360 Grill that are part of the cafeteria. Qdoba and Mojo Bowl will remain in their current locations on the west side of the building. 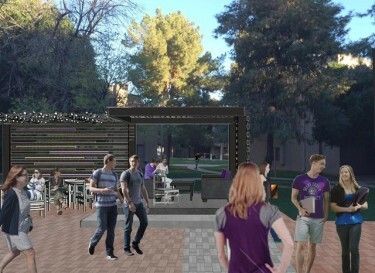 Outdoor eating areas will turn Lopes Way into a European-style promenade. What now are offices on the first floor of Prescott and Camelback halls will be filled with food options instead. Chick-fil-A and Subway will move from the ground floor of Thunder Alley and will be joined by Panda Express, Peet’s Coffee & Tea, and a grocery store with grab-and-go salads, sandwiches and pastas. The GCU merchandise store also will be added to that location. Mueller envisions a warm, feel-good atmosphere that will be open until 1 a.m. and will be a destination for visitors as well as campus residents. For example, fans attending basketball games, concerts, theatre productions and other events will have places to eat before or after the occasion. Cody Dumas, president of Associated Students of GCU, said students rated food their top priority in an ASGCU survey taken at its first meeting last fall. And it’s usually the conversation topic when a student wants to meet with Dumas one-on-one. The move away from a buffet-style cafeteria toward more choices plus the continued use of food trucks suits their collective palate. One of those options is the ability to sit together no matter who eats what. Under the current setup, anyone who wants to sit in the cafeteria has to pay to get in there. Now everyone will be able to eat whatever they want and sit wherever they want. Monorail Stop 2 is The Grove. It doesn’t take much prompting to get people talking excitedly about the new housing for 3,410 freshmen. The Grove has been rising steadily in the northwest corner of campus. “They’re the best dorms I’ve seen out of any college I visited,” said incoming freshman Shelby Langston of Chandler, who plans to study mechanical engineering. She’s destined for Acacia Hall after choosing GCU over Arizona State University, the University of Arizona and a private Christian university. “I’m super excited about the culture we’ll be able to build there,” said Jesi Weeks, who will be a resident director in Willow Hall. But the really super thing, Griffin said, is the idea of pairing freshmen in the same major, if they so desire, and helping them get acclimated quickly. In addition to Student Affairs and Academic Affairs offices, Juniper Hall also will house “Living Learning Communities” for STEM (science, technology, engineering and mathematics) and honors students. “We want to provide a better experience, higher involvement and personal and professional development in the areas of academics, social life and spiritual life,” said Zach Mikutowicz, program/process manager for institutional effectiveness. Matt Hopkins, director of Residence Life, said the expansion process has been an opportunity for rethinking old ways of doing things. There’s another aspect to The Grove that will change campus life for everyone, not just freshmen: Dropping 3,410 students into a previously uninhabited corner of campus will act like a counterweight on a scale. A construction worker eyes the beams in the engineering building. Stop 3 on our tour takes us across campus. This project, which consists of two four-story structures connected by elevators and stairs, was started earlier than any of the others. It had to be because, unlike The Grove, it’s more complicated with eight laboratories for students enrolled in new electrical, mechanical and biomedical engineering degree programs this fall. There’s also going to be a music recording studio for the College of Theology’s Center for Worship Arts. Our next stop is the building with the Big Top-looking roof, Thunder Alley. The ground floor will be converted to a place where students can gather to eat and relax. That makes perfect sense because the basement, Thunderground, is a popular student hangout with ping-pong tables, billiards and a bowling alley. The fifth stop on our tour: a four-story building that will be built in a central location on campus. The tentative plan is to put offices for the Administration, Student Affairs, Spiritual Life, Career Services and Athletics in that building. GCU’s monorail doesn’t have far to go for Stop 6. When Schellas Hyndman was hired as GCU’s new men’s soccer coach in January, Mueller said he wanted the sport to become a basketball-like centerpiece for the fall athletics schedule. In the middle of that mission is the new stadium, which will run north-south where the artificial turf Mariposa Field currently sits in front of Antelope Gym and Kaibab. That means that the two buildings directly to the south, the bookstore and the old Building 9 that has served many temporary purposes, will be leveled to create enough space. The 3,000- seat stadium seating won’t be ready in time for the season opener in September, but the field and grass berm that can accommodate 2,500 fans are expected to be in place. The stadium, which will face east to protect fans from the afternoon or early evening sun, will house six classrooms that can become team rooms during games. It is scheduled for completion by the end of the year. The list of significant changes doesn’t end at 3300 W. Camelback Road. Also scheduled to be open this fall are two nearby facilities that have been brought under the GCU umbrella with the idea of upgrading them into the centerpieces of new programs in the Colangelo College of Business. 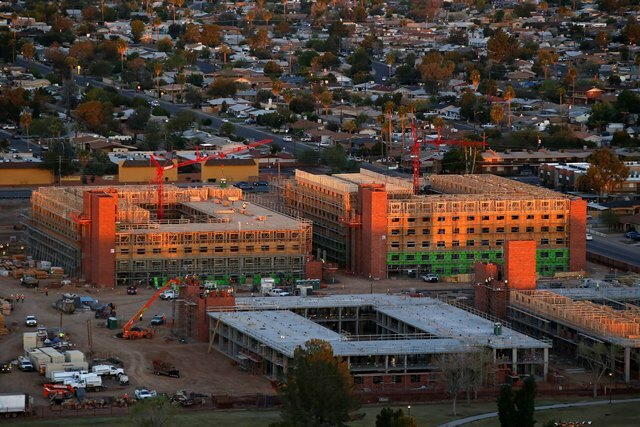 Maryvale Golf Course will be the hub of the golf course management curriculum, and Grand Canyon University Hotel and a conference center at Camelback Road and 27th Avenue will employ and teach students in hospitality management. Dumas, a junior, marvels at how much has happened in just three years. “It’s funny because there are times I don’t even recognize the campus,” he said. His attitude reflects that of his student constituency. 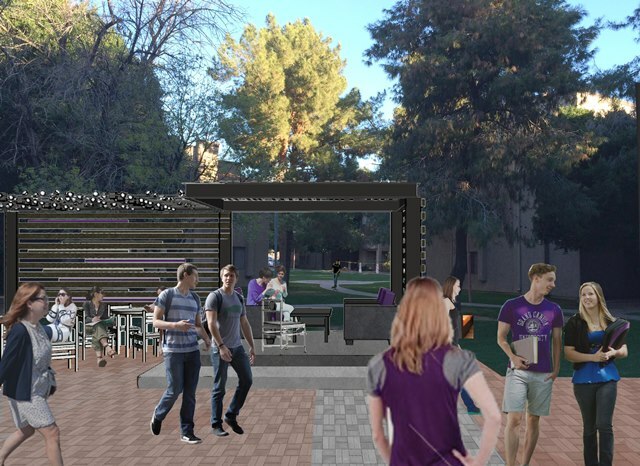 This is Topic A in campus conversations, and the sense of anticipation only figures to build this summer as The Grove gets its finishing touches and Lopes Way starts to take shape. “I talk with students from all over campus every day, and I think students are pretty excited,” Dumas said. With all that extra foot traffic this fall, he’ll get even more opportunities, starting with a Move-In that will be stretched to five days from three. GCU’s Tomorrowland is almost here, and the fireworks have just begun.